Anarchists. Proponents of the doctrine that rejects the state, private property, law, and external coercion. Anarchists in Ukraine were connected with various trends of Russian anarchism: anarcho-communism, anarcho-syndicalism, and anarcho-individualism. None of these movements had their beginnings in Ukraine, but were imported from Russia. The first groups of anarcho-communists were formed among Odesa workers at the end of the 19th century under the influence of the ideas of the Russian anarchist Prince Petr Kropotkin. Some of these groups were suppressed by the police in 1902, and some disintegrated. After the Revolution of 1905 the anarchists stepped up their activity. They disseminated their propaganda, staged terrorist actions, and extorted state and private money, particularly in Odesa. In 1905–6 the anarcho-syndicalists attempted to form an organization in Kharkiv, but failed. Because of police infiltration and banditry, most of the anarchist groups disappeared by the end of 1907. In Odesa and Katerynoslav, where anarchist cells survived until 1908, many anarchists were punished by death. In 1917 anarchist groups of different tendencies reappeared in a number of Ukrainian cities. At first they usually supported the Bolsheviks, but at times also opposed them. In Kyiv O. Feofilaktov revived an anarcho-communist group that had been suppressed in 1910. (For some time he had co-operated with Georgii Piatakov, the leader of the Kyiv Bolsheviks.) According to computations based on the anarchist press, there were various kinds of anarchist groups in about 25 cities and villages in Ukraine prior to the Revolution of 1917. The largest centers of anarchism were Katerynoslav, Kharkiv, Odesa, and Kyiv. The members of these groups were Russians, Russified Ukrainians, and, to a large extent, Jews. Although an attempt was made in 1914 to set up a Ukrainian anarchist cell, it failed. In general the attitude of the anarchists in Ukraine towards the nationality question, specifically towards the Ukrainian question, was indifferent or negative, since they regarded nationalism as an essentially bourgeois ideology. In the spring of 1918 many detachments of anarchists, which became notorious for the looting of towns, retreated with the Red Army from Ukraine, mostly from the Donets Basin. At this time the Bolsheviks turned on the anarchists and disarmed them. Anarchists from Ukraine participated in organizing the assassination of the Moscow Committee of the Russian Communist party in September 1919 and were liquidated by the Cheka. The Moscow anarchist group associated with the paper Nabat moved its operations to Ukraine in 1918 because of the increasing power of the Bolsheviks in Russia and the spreading peasant revolts against the Hetman government in Ukraine (see Partisan movement in Ukraine, 1918–22). There it established ties with Nestor Makhno. The group's leader was V. Eikhenbaum. In 1918–21 some of the peasant movements in Ukraine were led by anarchists, the most famous of which was Makhno's faction. The program of the Makhno movement was articulated by Russian anarchists; it consisted of an amorphous blend of anarcho-syndicalist ideas and slogans that appealed to the discontented peasantry—the will of the people, soviets without Communists, land distribution by local authorities, the free exchange of goods—and was directed against the agricultural communes, grain procurement and confiscation, and the Cheka terror. At Makhno's headquarters in Huliai-Pole near Zaporizhia there was a ‘free people's soviet.’ Its propagandists, including V. Volin, N. Popov, and P. Marin-Arshinov, published the anarchist periodicals Put’ k svobode and Nabat as well as various pamphlets and leaflets. Anarchists, as well as leftist Socialist Revolutionaries, were among Nykyfor Hryhoriv's followers. They also served in the larger detachments of the Makhno movement as political officers. 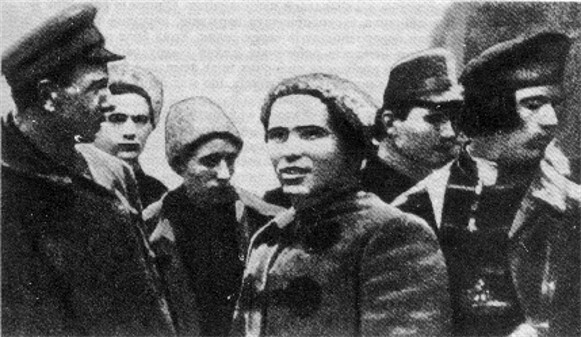 Although anarchist propaganda in Ukraine paid little attention to the Ukrainian question, a potentially serious rift over the theory and practice of anarchism began to appear in the last years of the revolution between the Russian and Jewish urban anarchists and the Ukrainian peasant masses, who constituted the overwhelming majority of the Makhno movement and whose views were defended by Nestor Makhno himself. When the New Economic Policy was introduced and the Soviet attitude towards the peasants became more moderate in 1921, the remnants of the Makhno movement were eliminated. The last organized expression of anarchism in Ukraine was the Workers' Opposition that emerged in the Bolshevik party in 1920 and was led by A. Shliapnikov, S. Medvedev, and A. Kollontai. After the Workers' Opposition, which was described as ‘an anti-Party anarcho-syndicalist group,’ had been defeated at the Moscow Congress in 1921, some of its members joined the Trotskyists (see Leon Trotsky) and were later liquidated with them during Joseph Stalin's Great Purge.